In February of 2008 under the administration of President George W. Bush, Jr., the United States Africa Command (AFRICOM) was officially launched with its base in Stuttgart, Germany. The reasoning behind the creation of AFRICOM has evolved over the last eight years from being a necessary security measure to protect vital American interests on the continent to a mechanism designed to assist post-colonial African states to enhance their national security apparatuses in light of the so-called “war on terrorism”, by then in full operation some four to five years after the invasion of Iraq and Haiti, and six-and-a-half years after the Pentagon occupation of Afghanistan. 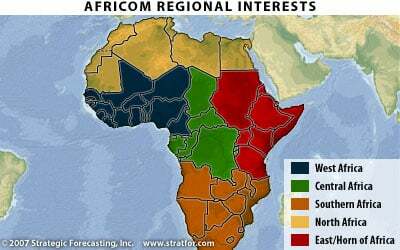 There was much controversy within the African Union (AU) member-states over whether AFRICOM should establish its headquarters on the continent. This idea initially was rejected by the Pentagon due to this objection by numerous African states of varying political outlooks and governmental systems. At this time, 2007-2008, the U.S. had initiated a war in Somalia in order to prevent the Islamic Courts Union (ICU) from fully consolidating power in that Horn of Africa nation fractured since 1991 after the collapse of the regime of Mohamed Siad Barre, a close ally of Washington. The administration of President George H.W. Bush in its final days had deployed 12,000 Marines to Somalia in December 1992, under the guise of responding to a humanitarian crisis of food deficits and internal conflict. This “Operation Restore Hope” was inherited by the administration of President Bill Clinton. The operation was soon exposed as a war of occupation. Somalians rose up against the presence of U.S., Canadian and United Nations troops. In July of 1993, the Pentagon troops bombed a location in the Somalian capital of Mogadishu killing over 50 leading members of several organizations including elders. In response to this massacre a full-blown war of resistance was waged by the people of Somalia. On October 3, 1993, at least 18 U.S. troops were killed in a battle in Mogadishu signaling the beginning of the end of this failed intervention. By early 1994, the U.S. and UN forces had withdrawn from Somalia. Nonetheless, they would later return after 2006-2007 in a proxy war for the maintenance of U.S. influence in the oil-rich and strategic nation of Somalia. AFRICOM first comprehensive military operation was carried out against the oil-rich North African state of Libya. Between February 17, 2011 and October 31, Obama deployed hundreds of CIA operatives to this country led for over forty years by Col. Muammar Gaddafi. After two UN Security Council resolutions were passed in March of that year beginning on March 19, the U.S. along with other NATO states including Britain, France, Italy, Turkey along with their regional allies launched nearly 30,000 sorties over Libya, a country of approximately six million, dropping nearly 10,000 bombs, killing 50,000-100,000 people and dislocating at least two million. Gaddafi, along with members of his family, was brutally assassinated by Islamist militias armed by Washington and its NATO allies. Leading officials and supporters of the Jamahiriya system were publically executed, imprisoned and driven into exile. Today Libya has gone from being the most prosperous state in Africa to one of its most significantly impoverished becoming a source of instability throughout North Africa and West Africa. The nation today is a major source of human trafficking with hundreds of thousands being channeled through the country in the dangerous voyage across the Mediterranean into Southern, Central and Eastern Europe. The UN Refugee Agency in a report issued in 2015, documented that the world is suffering from the worst crisis of displacement since the conclusion of World War II, where 60 million people are forced from their homes both internally as well as refugees. This crisis is a direct manifestation of the failed U.S. military, political and economic policies. This year’s presidential elections have been largely devoid of any substantive discussion on foreign policy particularly, with specific reference to the role of U.S. imperialism in Africa. Just recently, the Obama administration signed a military agreement with the West African state of Senegal, giving the Pentagon complete access to the country. In the Democratic Republic of Congo (DRC), a vast mineral-rich state, U.S. mercenaries were hired by a former governor of Katanga Province to supposedly provide security in the upcoming presidential elections. The Western Sahara, Africa’s last formal colony, has been prevented from holding a UN sponsored referendum on its future as a result of its occupation by Morocco, a close ally of Washington. It was revealed over the last several weeks as well that the CIA was involved in training children as spies against Al-Shabaab in Somalia. These developments alone with many others too numerous to mention in the course of this panel are occurring every week on the continent. At the three previous national conferences of the United National Antiwar Coalition (UNAC) resolutions were passed in opposition to U.S. interventions in Africa. Our task is to implement these decisions making them a material force in the current political situation in the U.S. Note: This paper was delivered at the Left Forum held at John Jay College of the City University of New York (CUNY) May 20-22, 2016. The presentation was made at a panel sponsored by the United National Antiwar Coalition (UNAC) entitled “The Fight to End U.S. Wars”. Other participants on the panel were Joe Lombardo, Co-coordinator of UNAC from upstate New York, Phil Wilayto of the Virginia Defenders for Freedom Justice and Equality, Sara Flounders of the International Action Center in New York City and Ana Edwards of the editorial board of the Virginia Defender newspaper published in Richmond. Obama said we will never be at war with Islam..